PITTSBURGH (AP) — Kenny Pickett isn’t offended by the term “game manager.” Last the Pittsburgh sophomore checked, the phrase isn’t an insult but a job description. “Every quarterback needs to manage the game first,” Pickett said. Pickett’s pre-snap checklist is lengthy. Is the protection right? Does he need to audible? Are the other 10 guys lined up in the right spot? What defense are the opponents in? “There’s a lot that goes on,” Pickett said. Each decision is vital in determining whether the ensuing play does or doesn’t work, one of the reasons why Pickett doesn’t get too caught up in what he does — or more specifically, what he doesn’t do — once the ball is in his hands. If he needs to throw it, great. If he doesn’t, even better. Pickett insists he’ll never get caught up in his own numbers. “My whole mindset is to find a way,” he said. While Pickett’s first full season as a starter largely lacked the dazzle of his spectacular coming-out party — he accounted for all three Pitt touchdowns in an emphatic stunner over then second-ranked Miami in the 2017 finale — he hardly cares. He passed for just 1,825 yards, the fewest since 1996 by a Pitt quarterback who played in at least 10 games. A smile Pickett has tried to maintain during a sometimes uneven year. The Panthers played a daunting nonconference schedule that included losses to Penn State, Central Florida and Notre Dame, games in which he was largely a nonfactor. 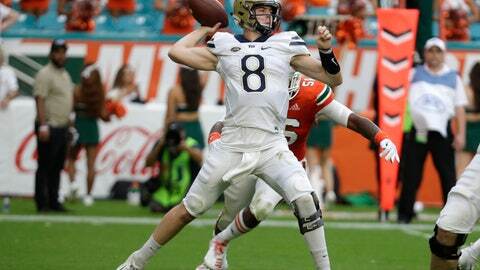 He averaged just 115 yards passing in the setbacks and his regular season ended with him watching from the sideline after Miami sacked him six times in a 24-3 defeat that took some of the momentum out of Pitt’s run to a division title. Clemson defensive coordinator Brent Venables is wary. The Tigers have one of the most dominant defensive lines in the country but gave up 510 yards passing last week to South Carolina’s Jake Bentley and have had issues this season with quarterbacks like Syracuse’s Eric Dungey, who are efficient if not dynamic. Briggs laughs at the memory, mostly because he understands he’s hardly the only one who’s been embarrassed after underestimating Pickett. It happened to Miami last fall. The Tigers understand they can’t afford to let it happen to them if they want to reach the College Football Playoff for a fourth straight year. Pitt is a 25-point underdog. That’s fine by Pickett. Defying the odds is kind of his thing. He watched on TV two years ago when the Panthers stunned Clemson in Death Valley. His view will be far different this time around. A win and the Panthers take another step closer to achieving the vision Narduzzi outlined to Pickett on the recruiting trail, a vision set on winning, not mind-boggling stats. Just the way Pickett likes it.